This was the third & final day of our outing. After breakfast we left Vijay Vihar around 9-15. Distance from Vijay Vihar to Anupu is about 22 kms and travel time is about 45 minutes. The road is twisty and passes on hill slopes until Vijayapuri South - the port town on river Krishna right bank situated in Andhra Pradesh. From Vijayapuri North to Anupu, the road is more or less flat with straight stretches. Again as we approach Anupu archaeological site, the road goes downhill. 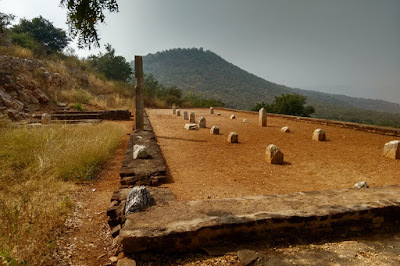 The site is situated on a flat piece of land between the hills close to the shore. The site consist of 3 restored monuments- 1. 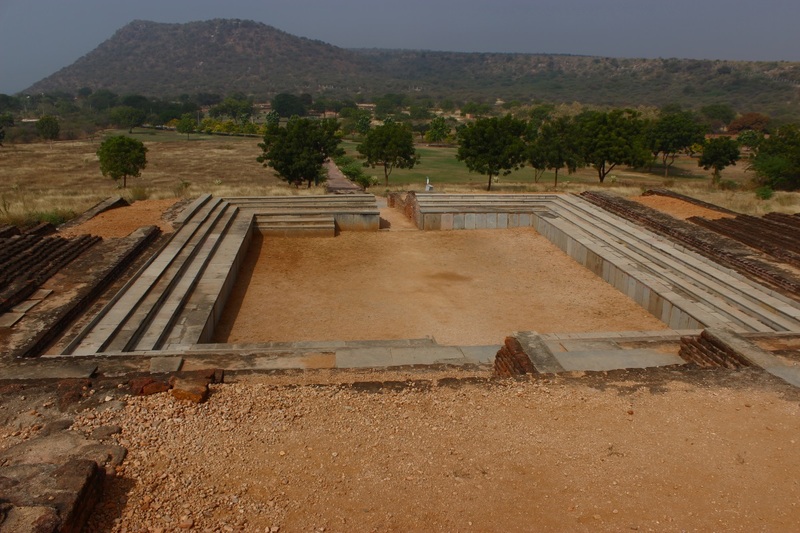 Buddhist university complex, 2. remains of Harithi temple and 3. amphitheater. Also, close by is an ancient shrine dedicated to Lord Ranganatha. First we stopped at the University Complex. From the security guard we learned that the site is open from sunrise to sunset. I regretted not coming earlier in the day while weather was pleasant. It was around 10 and hot. Being surrounded by hills, there was hardly any breeze. We spent about 45 minutes and moved on. A quick visit to Ranganatha Swamy Temple and then we reached the amphitheater. Amphitheaters are interesting.. modern or ancient. 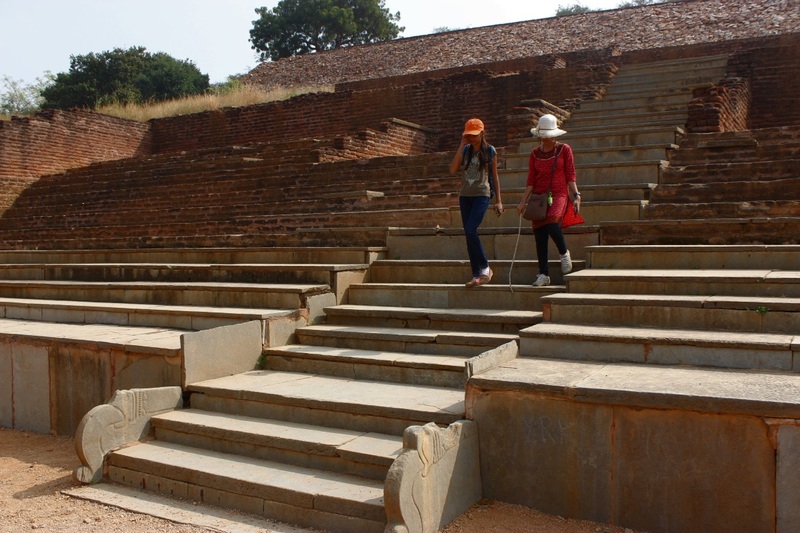 Here we are looking at a restored monument which was originally constructed at the Buddhist site in Krishna river basin. 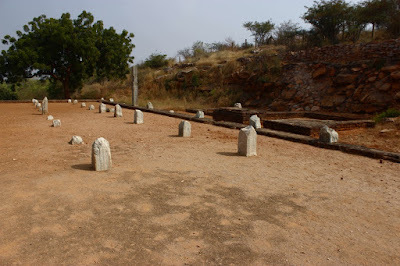 This is one of the several monuments where we relocated while many remain submerged in Nagarjuna Sagar. This transplanted imposing structure contain multi tiered gallery on all the four sides and can accommodate about a thousand spectators. It is an unique example of architecture in ancient India and probably inspired by Roman tradition. Yet, unlike the common Roman prototype it encloses a rectangular area 16.46 x 13.72 m. instead of an oval. 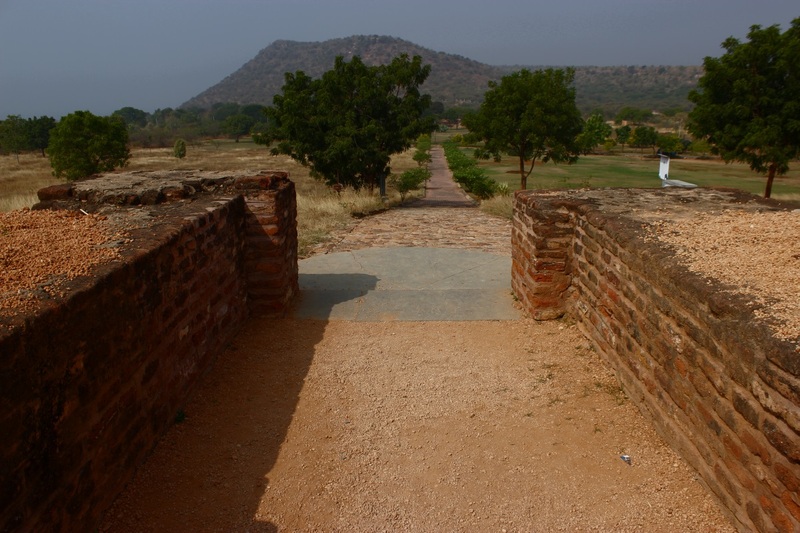 The brick built structure, entirely cased with stone slabs, had at least sixteen tiers. The place could have been used for sports and wrestling as attested by several scriptural representations of wrestling scenes from Nagarjunakonda. This is the entrance to the stage. For spectators to reach the seats, there are three flights of steps, two on either sides and one in the middle. Multi-level seats for spectators as seen at the entrance. 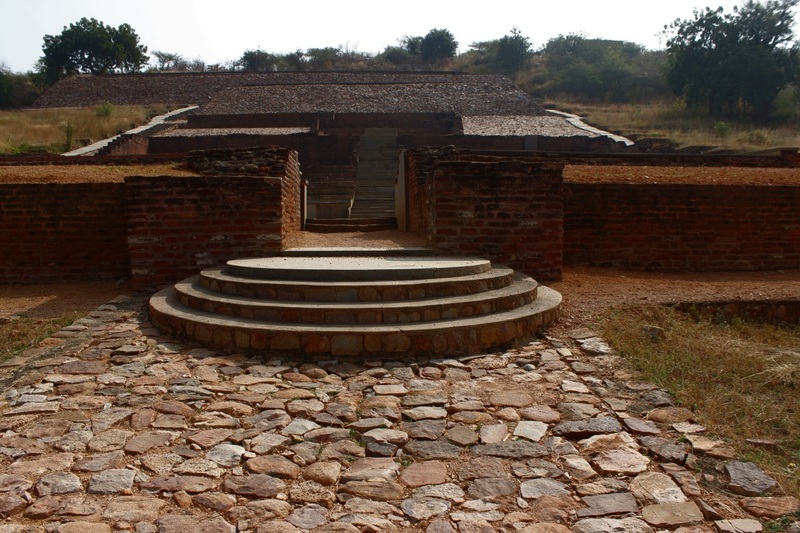 The structure is made of red bricks and Shahbad stones. These bricks measure approximately 9" x 6" x 2". The overall width / length is approximately 100' / 320' respectively. The theater is aligned east-west, with the slope facing west. Generally events are held during second half of the day, so there would be light until sunset. I let Pushpa and Bhuvana climb up first. They might have stayed back had I climbed up first. Another view of the seats around the stage. Complete view of the stage and spectators area. At the higher levels, there are remains of cells or rooms. I think this amphitheater was used for religious discussions or debates. Buddhists monks debate over spiritual topics watched by a set of judges. The debates can go on for days with resting periods in between. I feel this structure is better suited for such events. At the highest level there are remains of several pillars and few cells. 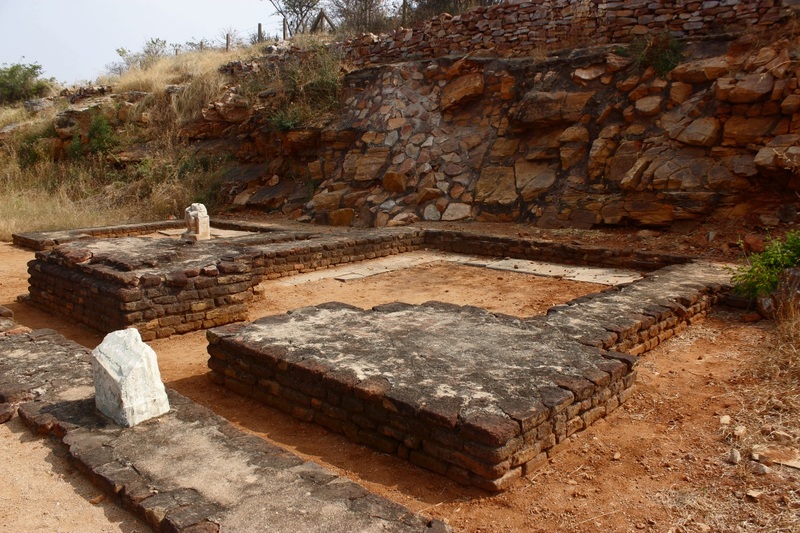 The cells might have been used for resting or meditation. While researching I stumbled on an article with a reference to this theater. 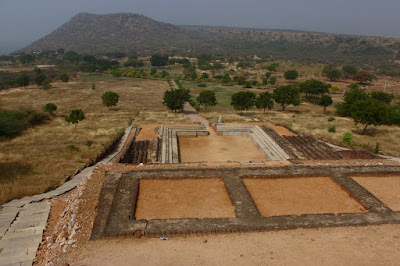 According to the article the top-most level is Hariti temple. Hariti is a Yakshini instructed by Buddha, she's the protector of Buddhist doctrine. Here's the article which describes the theater and the temple ..pages 91, 92, 93 and 94. Central chamber at the peak and besides it is a smaller chamber with a damaged statue. 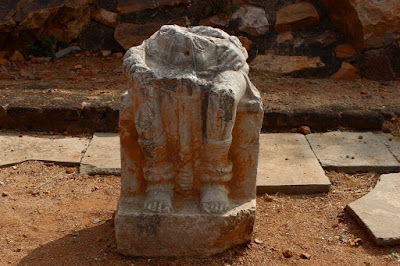 This could be the damaged remains of the deity - Hariti. 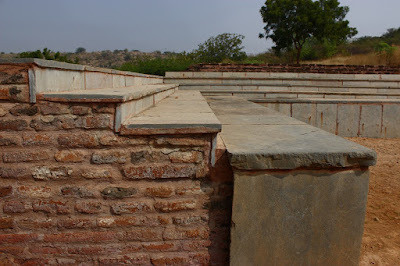 Another view of Hariti temple. Up here there was slight breeze, tiny relief from the heat. Had it been early morning or evening we might have spent more time here. We decided to leave, we had another spot to check out before checking out of this archaeological site. If you wish to visit this spot, plan to reach by 7 AM and leave by 9 AM or reach by 4-30 PM and leave by 6 PM. Though a restored site, a visit is worth the time and effort. Talking about amphitheaters, the first one I ever saw was probably the Colosseum in "Enter the Dragon." 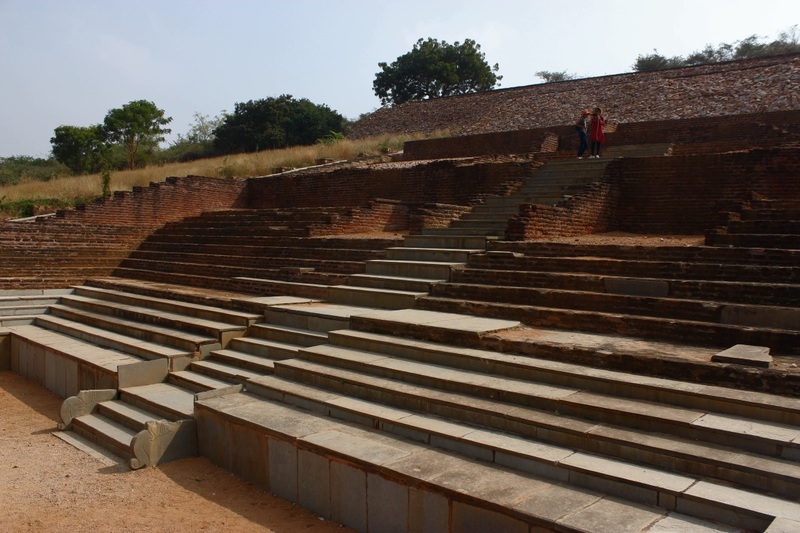 The first one I stepped into was the open air theater at Annie Besant Park near Doddaballapur. Then there' one at Kannada University, Kamalpur, yet to see it. 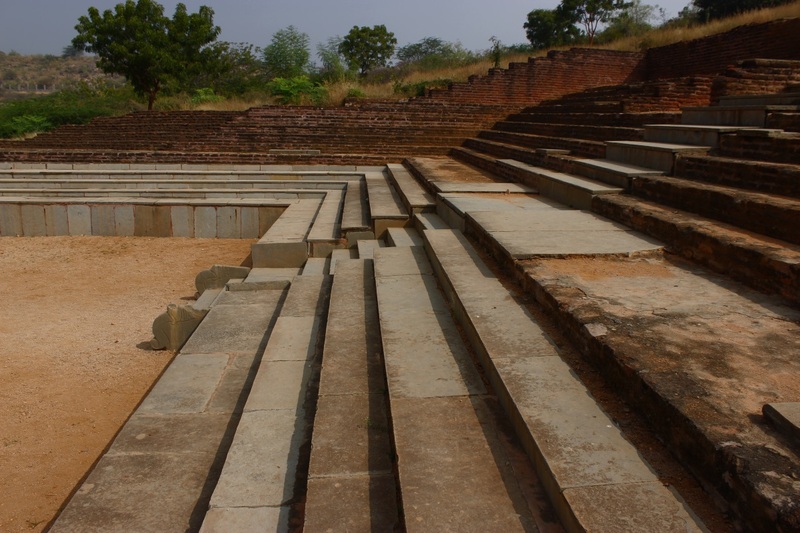 Karnataka College and Sadankeri at Dharwad have small open air theaters. Oh, have to mention the one at Shilparamam, Hyderabad - this one is ever active with cultural programs. 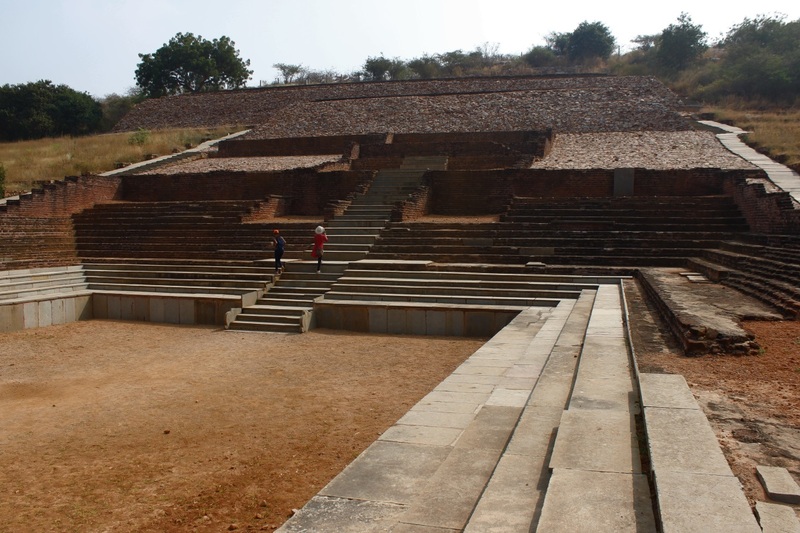 I never knew there were such elaborate and large amphitheaters in India. Neither did I know or even imagine that they were kept so nicely. And that you share the book details that describe it, make it a wonderfully thorough gem of a find. Your views and thoughts are inspiring! I'm looking forward to a historical trip with you. Thank you, Nikhil.